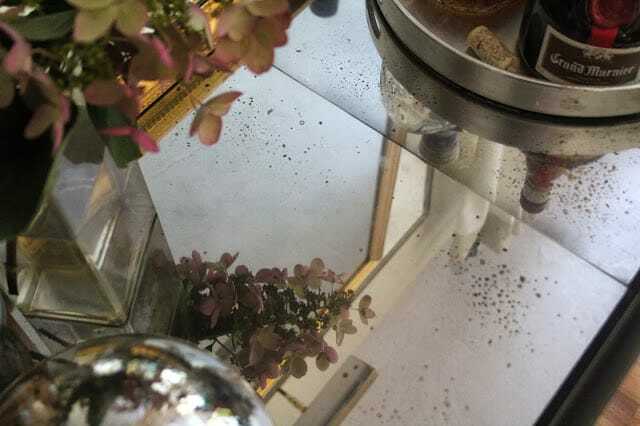 Mercury glass – it’s so pretty, isn’t it? Real mercury glass is glass that is double walled, with a liquid silvering solution poured between the layers and sealed. 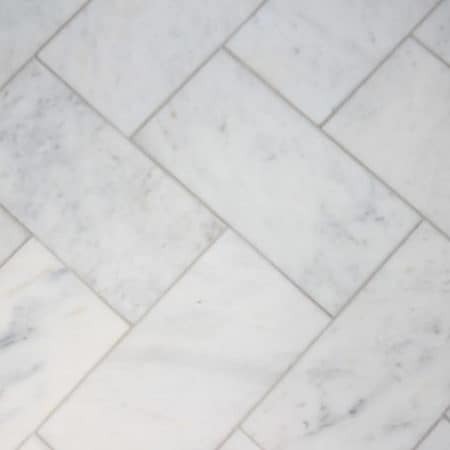 It has a very similar look to antique mirrors that have a mottled affect. Did you know that there’s an easy way to achieve the mercury glass look on glass shelves, vases, votive candle holders and light fixtures? This is one of my favorite crafty projects ever! 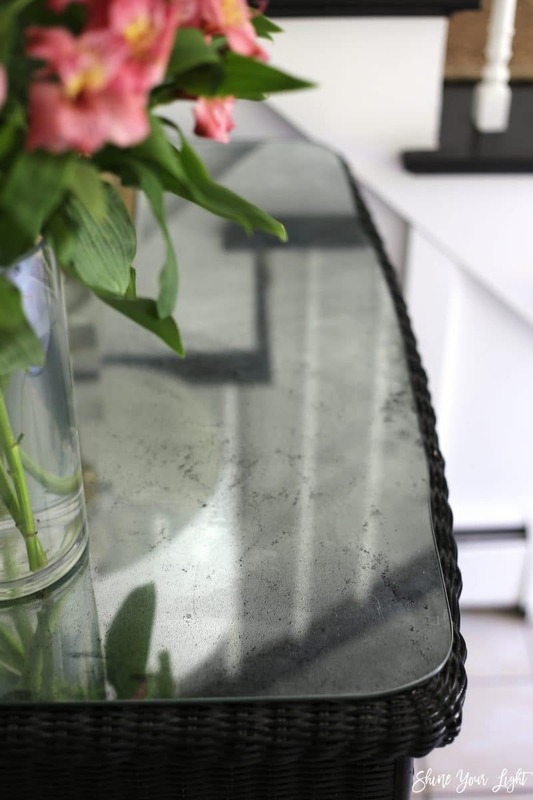 My DIY mercury glass obsession started few years ago when I turned a baby changing table into a bar cart. After I painted the table it still looked like a changing table, so I decided to try mirroring glass shelves for it. I am not kidding when I tell you this little hack completely transformed the table!!!! The mirrored shelves are the perfect finishing touch for this piece of furniture, and they make the top more functional since drinks will be poured on this surface. 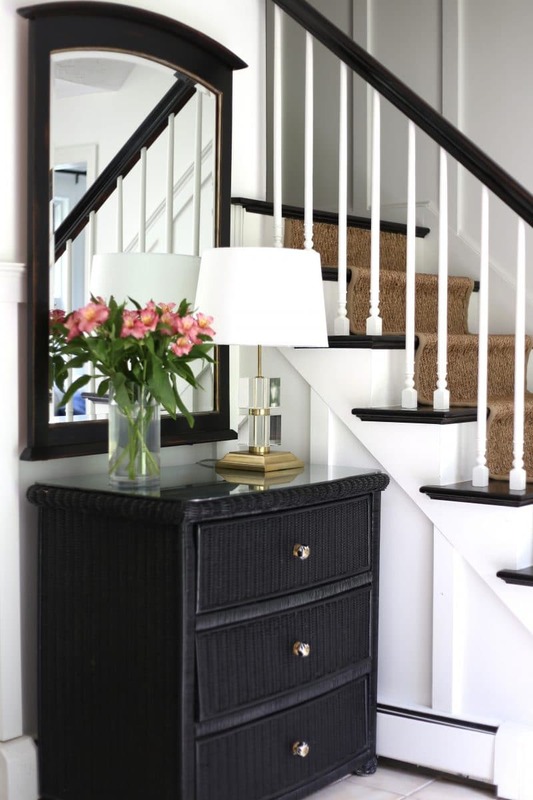 I ended up selling the bar cart when I turned our TV armoire into a bar cabinet, and then went on to give the mercury glass treatment to the vanity top in our master bedroom, and the glass top of this dresser in our foyer. I just can’t stop! I really love that bit of antique patina and subtle reflection of light it brings to the space….. 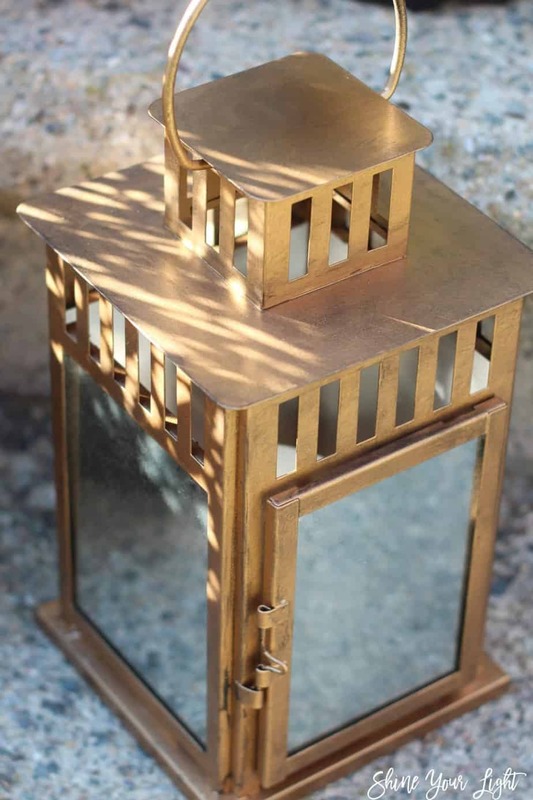 I also gave basic Ikea lanterns a brass and mercury glass makeover. It’s just so fun to see how the paint comes out each time! Have I convinced you try this fun paint project yet? Are the wheels turning in your head about what in your house you can use this technique on? I know, me too! It truly is fun to try! So here we go…. This is the #1 most important part!! 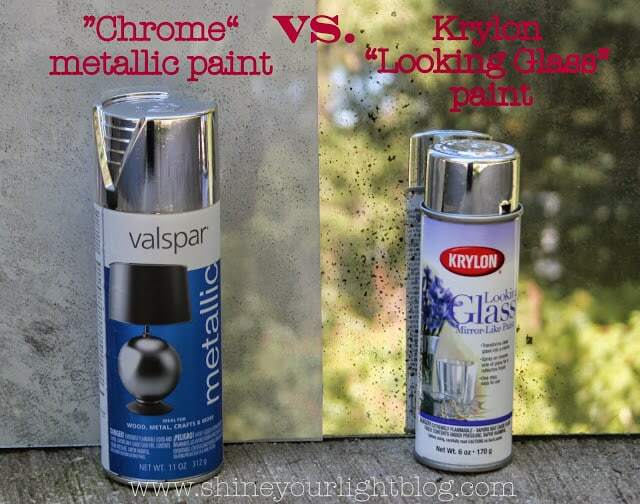 I searched in 5 or 6 stores for Krylon Looking Glass spray paint. When I couldn’t find it, I decided a shiny chrome spray paint would do the job just fine. Isn’t the cap on the left super shiny like a mirror??????? Well, guess what…..shiny chrome spray paint does NOT give you a mirror finish. The Krylon Looking Glass spray paint, on the other hand, really does – it’s awesome!! Look at the difference! I used the same technique on both pieces of glass above and the chrome spray paint just looks like silver paint, so be sure to use the Looking Glass spray paint for this project. I found it once at Walmart, but it’s hit or miss, so now I just buy it here and save myself the headache of driving around hunting for it. 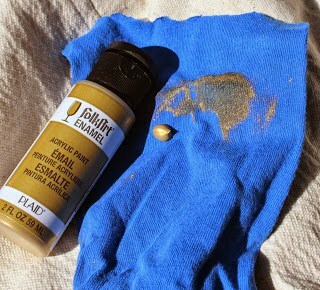 Beware – the Looking Glass spray paint comes in a small can – only 6 oz. compared to the normal spray paint can size of 12 oz. Also, it’s twice as much as regular spray paint, but it’s worth it if you’re looking for a real mirror finish. I used about 1 1/2 cans for the bar cart shelves. The glass on my foyer dresser was custom cut to fit by a local glass shop. It’s tempered, 3/8″ thick and has polished edges. The glass that comes with the Ikea laptop desk I use as my vanity is thinner but also tempered, with finished edges. For my bar cart shelves I used regular window/basic picture framing glass. 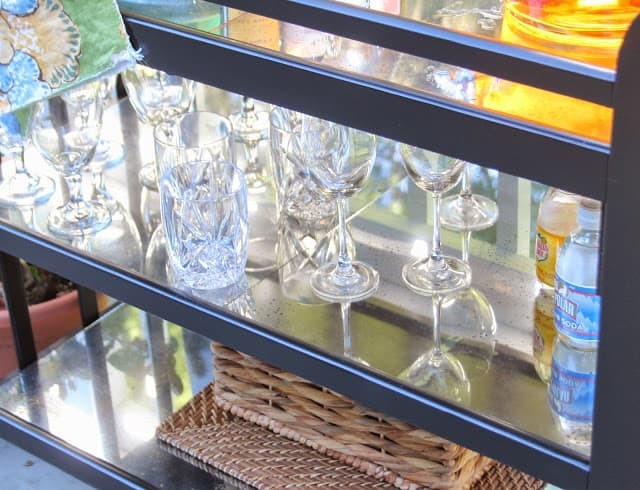 FYI – window/picture frame glass is more fragile than real glass shelves and does not have finished edges so it’s sharp; to line the shelves of the bar cart, the picture frame glass is fine as it won’t take a lot of abuse and the edges are concealed. This same kind of glass is in the Ikea lantern, and would work well for a backsplash too. For shelves that need to be strong and shatterproof, or for a tabletop, I would recommend custom cut, tempered glass from your local glass shop. Cutting the glass to size: you can cut sheets of glass yourself with this little tool that you can buy at a hardware store. This little gadget scores the glass, and then you snap the glass apart. However, scoring a sheet of glass properly with this tool is really difficult for a novice. Often the glass does not break perfectly, ruining your piece of glass. It’s tricky to get right so I highly recommend having the glass cut for you. If you have the glass cut, price it out before buying. I found my small local hardware store was much cheaper than the big box craft stores who do picture framing, or the big box hardware stores who sell glass for windows. The glass for the bar cart cost $40 at my local mom-and-pop hardware store. 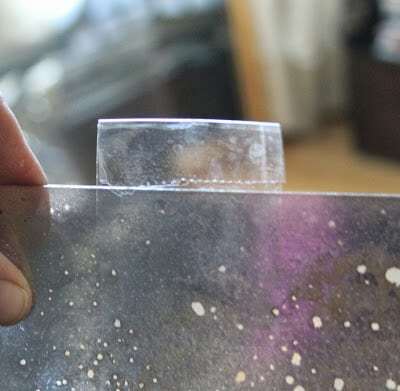 Spray the back of your glass item with a light coat of the Looking Glass spray paint, then immediately mist with the water/vinegar solution. 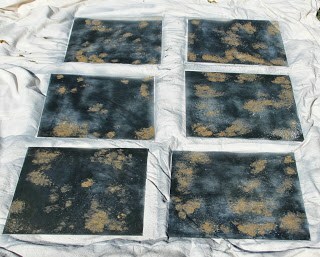 Let dry for 15-20 minutes, then coat with spray paint again, immediately following with the water/vinegar solution. 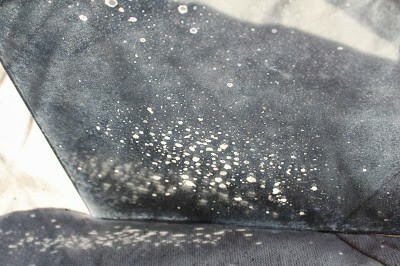 The glass in the lower left corner is turned over in this picture and is reflective even after one coat. 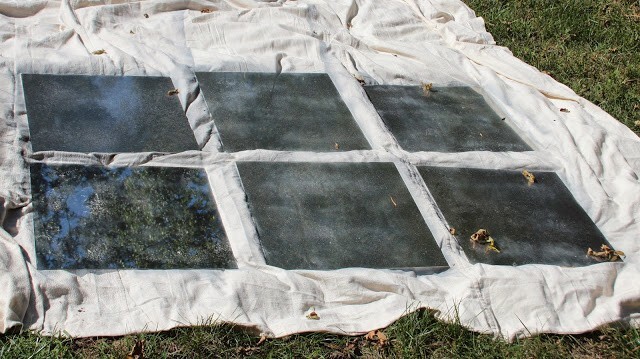 Allow to dry, then use the rag to clean the surface of the glass. The water/vinegar prevents the spray paint from sticking in some areas, creating the mottling affect. You can leave your glass like that, or use the gold and/or black craft paint over these areas. 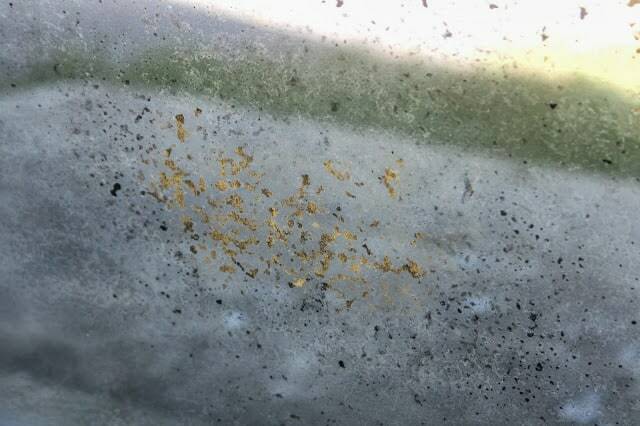 I dabbed the craft paint on the spots…..
and this is the affect of the gold and black through the mottling. To use my glass for shelves on the bar cart, I placed a piece of packing tape on the back of the glass and folded it over to make a little tab so that if I want to remove the shelves later for any reason, they will be easy to lift up. The gold is very subtle but pretty, especially when I used the cart on my deck in the sunlight. 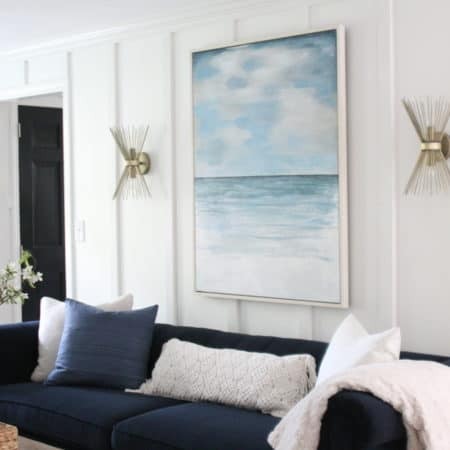 I have only used this painting method on glass shelves and tabletops, but you could try it on glass vases with wide openings, hurricanes, votive holders and glass lighting fixture shades like the ones you see on pendant lights. Creating DIY mercury glass is so fun, I promise, you’ll love it! PIN THIS POST TO SAVE! Wonderful! Believe me, after the metallic gold spray paint, I bet I'll go crazy next with this spray since the holidays are coming up to! I'm a huge sucker for mercury glass and vintage glass so this is great! Thanks for sharing my friend! Have a great weekend! Wow! Your glass turned out wonderful!!! I have two very old tables that might have a "new" life if I were to top them with mercy glass…I feel a project coming on!!! i've used this before and love it! nice elegant glamorous touch! I might need to try this. It looks so good! Consider yourself armed and dangerous with this new skill! What a fun project! 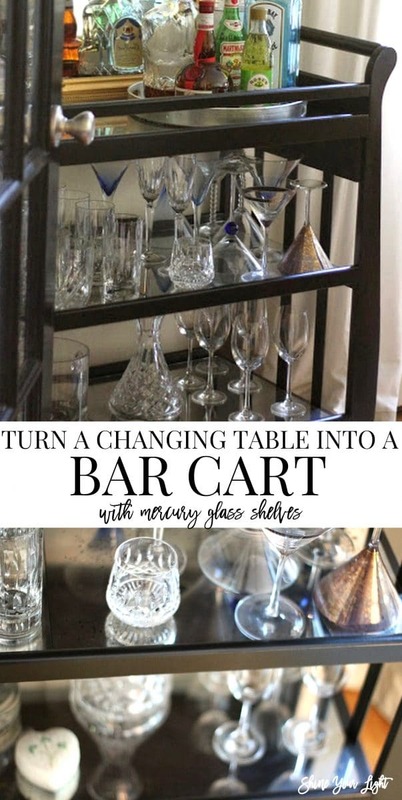 Oooh, this is such a fun project, it's the perfect detail that gives your bar cart a high-end designer look!!! I can't remember if I said this or just thought it, but you are going to have so much fun styling if for the holidays! Thanks for the great tutorial! I think this is my favorite of favorite tutorials. I will be using this for a project I have in mind. Thank you! I will definitely be trying this. Great tutorial and what a bummer about the glass at AC. I love the added gold. One project I've never tried. You got such a beautiful result, I never would have known those weren't real mirrors! Thanks for all of the great glass tips, too. My Dad and I have used the glass cutter tool before and yeah, it's tricky. I didn't know that Lowe's would cut glass. Your cart turned out SO well, Lisa! LIsa, this was genius. I love the antiqued mirror look of the glass. Such a fun detail to add to the bar cart. Great tips about having glass cut too. Awesome, thanks! 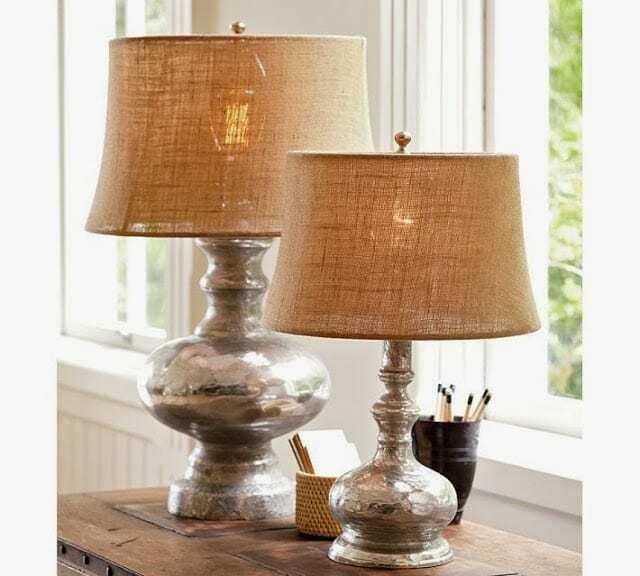 I want to refinish some lamps that I have, hoping that isn't too labor intensive. I was looking for something that gives a mirrored finish, or as close as possible, to the surface of things. It won't be mirroring through glass, but sprayed onto a smooth plastic item. Did you happen to notice how well the looking glass krylon does for that, maybe? Thanks so much. Impressively thorough write-up, I must say. Well done! Thank you so much for this tutorial! I was looking for someone who used flat glass with this paint as opposed to jars or votives. I'm adding some glass panels to a media console, and will definitely be using this as a guide to add that look to them! Very pretty! Just an FYI-the glass sold at craft stores isn't strong enough for shelving, tempered glass would be better. Also, the quoted price may be high because it may have a UV coating for protecting artwork. I don't know about A.C. Moore, but Michaels only sells UV coated glass, and giving quote over the phone leads to misunderstandings (which could explain their hesitation-even though there's no excuse for rudeness =-) ). Thanks Christina! I love how that glass came out. That mirror spray paint is really great! Would this work on a vase? How would I cure the paint to make it handwash or dishwasher safe? If the vase had an opening big enough to spray the paint evenly then I would think it would work, but I haven’t tried it myself! 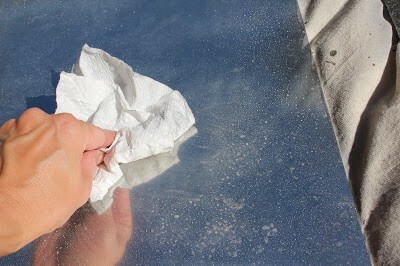 You could probably add a layer of spray sealant like a polyurethane to protect the paint and make it hand-washable. I wouldn’t take the chance of putting it in the dishwasher though. Are the diy mercury glass votives heat proof? Will the paint peel or burn while burning the votive candles? I did not make votives with this paint method – I used it on glass shelves for a piece of furniture. The paint is flammable so I imagine it wouldn’t be safe for DIY mercury glass votives! I am helping my friend do this for her wedding. We are doing votive candle holders. The paint says flammable. Should we paint the outside then? Will this give the same look? Hi Miranda, I’m not sure about using this method on votives. I used this paint for shelves. The side that has the paint on it doesn’t have the antique mirror affect, just the glassy side, so I’m not sure it would work as well on the outside of the votives. I hope that helps with your project! I have a tray I have been thinking about updating. This would be perfect for the glass insert. That’s a perfect use for mirrored glass Lauren! This is lovely and a great transformation! 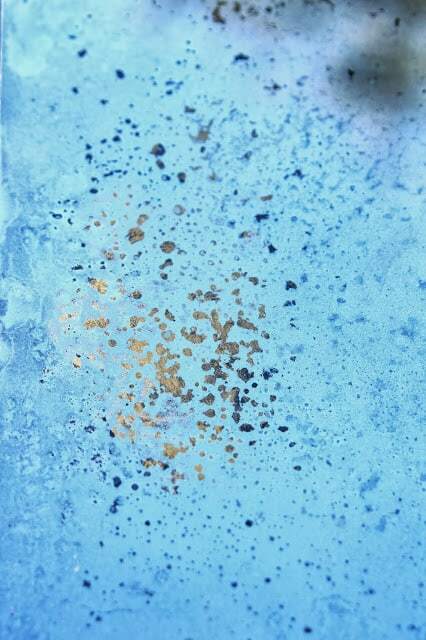 I’ve been meaning to try mercury glass paint and your post is a reminder for me to put it on my shopping list. It’s really fun to try Beverly! It comes out a little different every time I do it and I love seeing the results and playing around with it! Hope you enjoy it too.